Built on a legacy of more than 30 years of motorsports leadership, NISMO – the heart and soul of Nissan performance for both the track and on the street – continues to raise the bar for factory-direct enthusiast vehicles. Fresh on the heels of the introductions of the GT-R NISMO and JUKE NISMO RS models comes the significantly reimagined 2015 Nissan 370Z NISMO. As the flagship of the Nissan Z® portfolio, the Z® NISMO, since its introduction as part of the original Nissan 350Z lineup, has embodied the spirit of NISMO – race-proven engineering that is attainable. The redesigned 2015 370Z NISMO takes that motorsports mojo, and the balance between street and track, to a new level of distinctive style and performance. 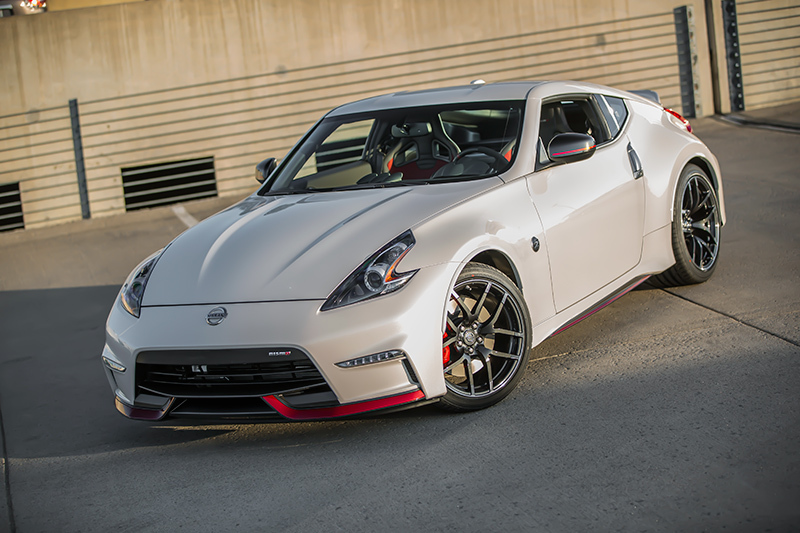 Along with the new look, two other major changes are added for 2015, giving buyers more ways to enjoy the unique experience that is the 370Z NISMO: a new 370Z NISMO Tech model with standard Nissan Navigation System and an available 7-speed automatic transmission option. 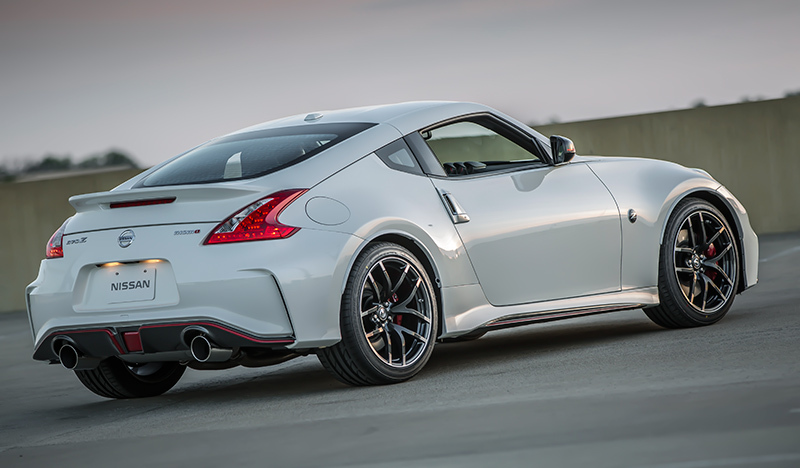 The most striking revision to the 2015 370Z NISMO is its refreshed exterior design. Its GT-R-inspired functional and fully integrated aerodynamic body pieces have been redesigned to provide an aggressive and more aerodynamic new appearance – as well as optimizing front and rear downforce. Upfront, changes include a dramatic new, deep front fascia with Hyper LED Daytime Running Lights and black headlight bezels, which provide a greater level of visual differentiation from standard 2015 Nissan 370Z Coupes. A fully integrated chin spoiler enhances the sense of dynamic movement, while enhancing airflow and downforce for exceptional aerodynamic performance. The front also features the addition of a NISMO emblem and signature NISMO red stripe accents that continue from the spoiler down the special side sill protectors. In addition to a bold new rear fascia, the unique NISMO rear spoiler has been reshaped and downsized. The 370Z NISMO is now slightly shorter than the previous design – 170.5 inches in overall length versus the 2014 model’s 173.4 inches – though remaining 3.0 inches longer overall than a standard 2015 370Z Coupe. As in previous years, the rear appearance is capped off by a pair of large chrome-tipped exhaust outlets. Other exterior features include an aluminum hood, bi-functional xenon headlights with automatic on/off function, distinctive vertical door handles and heated outside mirrors with integrated turn signals. Just four exterior colors are offered: Pearl White, Magnetic Black, Brilliant Silver and Solid Red. Also adding to the distinctive 370Z NISMO appearance are 19-inch NISMO super-lightweight forged aluminum-alloy wheels by RAYS. The wheels have been restyled for 2015 with a twin-five spoke design and a charcoal gray machine-finish (formerly silver). The wheels are mounted with Bridgestone Potenza S001 Y-rated high-performance tires (245/40ZR19 front, 285/35ZR19 rear). The 370Z NISMO model’s motorsports-inspired look and feel continues inside the driver-centric 2-seat cabin. The unique NISMO-styled interior is enhanced with redesigned black-and-red Recaro® leather-appointed seats with Alcantara® accents. The new seats were co-developed with Recaro® exclusively for the 2015 370Z NISMO. They are designed to provide more uniform body pressure and better all-direction holding during spirited acceleration, braking and cornering. Both the driver and passenger’s seats feature standard 8-way driver’s/4-way passenger manual adjustments. The interior also features red seat trim and stitching with NISMO logo, an Alcantara®-appointed leather-wrapped steering wheel and NISMO red tachometer. The tachometer and speedometer include an “initial sweep” function, coming alive when the 370Z NISMO is first started. Like all Nissan 370Z interiors, the layout is built around a deeply scooped instrument panel with a full-length center console separating the driver and passenger’s seat. In the rear is an open cargo area with easy accessibility. The instrument panel includes a 3-pod cluster with oil temperature, voltmeter and clock, power windows with one-touch auto up/down function, power door locks with auto-lock feature and automatic climate control. Other interior details include a smooth leather-wrapped shift knob and aluminum-trimmed pedals. The 370Z NISMO Tech model also includes a standard hard drive-based Nissan Navigation System with 7.0-inch VGA touch-sensitive display, along with a RearView Monitor, auto-dimming rearview mirror and HomeLink® Universal Transceiver. As in previous years, the 2015 370Z NISMO is powered by a 3.7-liter DOHC V6 engine with Variable Valve Event and Lift Control (VVEL). The advanced powerplant is rated at 350 hp @ 7,400 rpm – 18 horsepower more than a standard 370Z Coupe – and 276 lb-ft of torque @ 5,200 rpm. The VVEL system helps optimize intake valve open/close movements, allowing the needed air to be sent promptly to the combustion chamber at the precisely optimized time. The 370Z NISMO’s enhanced engine power and acceleration (versus non-NISMO 370Zs) is provided through use of an exclusive H-configured exhaust system design and muffler tuning, along with optimized ECM (Engine Control Module) calibration. Two transmission choices are offered for the first time on a Z® NISMO model. The close-ratio 6-speed manual transmission features standard SynchroRev Match, the world’s first synchronized downshift rev matching manual transmission, which allows rev-matched heel-toe-like downshifting. The SynchroRev Match® function automatically controls and adjusts engine speed when shifting to the speed of the next gear position, essentially “blipping” the throttle to smooth out any up/down shifts. This not only allows the driver to focus more on braking and steering, it improves the smoothness of gear shifts by reducing the typical “shock” when the clutch is engaged. The system can be deactivated with a button next to the shifter for drivers who prefer to shift on their own. Newly available is a refined 7-speed automatic with Downshift Rev Matching (DRM), Adaptive Shift Control and manual shift mode with paddle shifters. The standard 370Z Coupe double-wishbone front/4-link rear suspension design suspension is specially tuned for the 370Z NISMO, offering exceptional handling – including higher spring and stabilizer bar rates and increased roll stiffness and front and rear damping factors (compared to non-NISMO models). The 2015 370Z NISMO also features a tight, rigid body structure with a strut tower bar brace and a pair of performance dampers, which quickly and efficiently react to help control body vibrations from road input via the tires, contributing to the 370Z NISMO model’s outstanding handling and performance feel. Also standard is a Viscous Limited-Slip Differential (VLSD) with shorter final drive ratios than standard 370Z for better acceleration feel – 3.692 vs. 3.357 (A/T); 3.916 vs. 3.692 (M/T). The 2015 370Z NISMO’s long list of standard safety and security features includes the Nissan Advanced Air Bag System (AABS) with dual-stage supplemental front air bags with seat belt sensors and occupant classification sensor; front seat-mounted side impact supplemental air bags; roof-mounted side-impact air bags; seat belts with pretensioners and load limiters, Zone Body Construction with front and rear crumple zones, Nissan Vehicle Immobilizer System, Vehicle Security System and Tire Pressure Monitoring System (TPMS). Along with the 370Z NISMO, the 2015 Nissan 370Z is available in 370Z Coupe and 370Z Roadster models (please see NissanNews.com for full information).